It is not always possible to eat organic, but whenever you can, do. By opting to eat organic, you will avoid pesticides and genetically modified organisms (GMO’s). Pesticides, particularly organophosphates and carbamate have been linked to cancer and cause nerve damage. GMO’s have been linked to infertility, immune problems, insulin issues, allergies and damage to the gastrointestinal system. If a food is labeled organic, it cannot be genetically modified and is generally lower in pesticides and chemicals. I recommend using a carbon filter system, which is the most effective at filtering out chemicals such as arsenic, fluoride, chlorine, lead, copper, and mercury. It is good to have a whole house filtering system, or especially a Berkey system for your drinking water. Always carry a BPA free water bottle. such as the Berkey Sports Bottle to filter out unwanted toxins. The best way to keep up with your toiletry products is to go to EWG’s (Environmental Working Group) website. Shampoos, creams, makeup, perfumes, toothpaste, deodorant and other items are not regulated meaning they do not have to undergo any safety testing. This can be very misleading to the consumer because “organic” and “natural” may mean nothing. Avoid products containing parabens, fluoride, propylene glycol, formaldehyde, lead, mercury, aluminum, sodium laurel sulfate, and phthalates. These chemicals are linked to many reproductive problems. Dangerous chemicals are formaldehyde, thiourea (carcinogen), perchloroethylene, nonylphenol ethoxylate, DEGME are all found in products that we use regularly. EWG is another great source for recommendations for cleaning compounds. Did you know manufacturers do not adequately disclose what is in their products? A great recommendation is to make your own household cleaners with such ingredients as vinegar, baking soda, tea tree oil and hot water. The overall goal is to make some simple changes so you can reduce your exposure to toxins and reduce the toxic load to your body. Information summarized from Paleo magazine. Paleo magazine can be ordered online from Amazon or purchased at your local health food store. Worried about your diet and whether you’re getting the foods you need? While you may know fast foods can lead to heart disease, most people don’t realize that good food can actually improve your heart. Include these super foods on a regular basis and be on your way to better heart health. Supercharge your defenses, eat smart, and eat well! Wild Salmon is the superstar of the Omega 3 fats, which reduce inflammation and heart disease. It’s critical to have the proper balance of Omega 3 and Omega 6 fatty acids. It’s easy to get the Omega 6 fatty acids from corn, safflower, cottonseed, and sunflower oils, but it’s more difficult to get the Omega 3 fatty acids. While other fish like halibut, sardines, mackerel contain Omega 3 fats, wild salmon tops the list because of its higher content. Farmed salmon eat grains, which means they produce very little Omega 3 fatty acids. Include wild salmon 2-3 times per week to protect your heart. Walnuts are also rich in Omega 3 fats and plant sterols, which lower cholesterol. 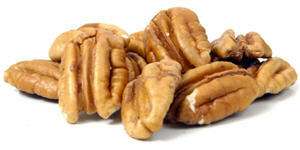 Walnuts provide fiber, protein, vitamins, minerals and healthy fats to lower risks of heart disease. Finely chop nuts to coat meats, fish, and poultry. Include a handful of nuts daily to protect your heart, and don’t be afraid to include almonds, pistachios, or macadamia nuts. Extra Virgin Olive Oil is a good source of monounsaturated fat, which helps lower cholesterol and blood sugar levels. Olives, both green and black are another source of good fat which can be eaten by themselves or added to salad. Kiwifruit is an amazingly, high fiber, tasty fruit which is very rich in antioxidants, and phytonutrients to fight heart disease. Remember fiber helps lower cholesterol. There is even research showing that kiwi works as a blood thinner. Rich in fiber and healthy enzymes, kiwis can be added to smoothies; peel, seeds and all. Avocados are the only fruit that contains monounsaturated fat. This type of good fat lowers cholesterol and is packed with monounsaturated fat which lower LDL levels while raising the amount of HDL cholesterol in your body. This rich supply of healthy fat along with other nutrients and phytochemicals in avocados promote cardiac health. Flax seeds are high in fiber as well as omega-3 fatty acids which are good for your heart. Another reason is their high fiber content. Add them to your smoothies or on top of your salad. Blueberries as well as other strawberries and other berries are rich in anthocyanins and flavanoids which can help to dilate blood vessels and lower blood pressure. Anthocyanins give plants their red and blue colors. Pomegranates contains numerous antioxidants, including heart-promoting polyphenols and anthocyanins which may help stave off hardening of the arteries. Compounds found only in pomegranates called punicalagins are shown to benefit the heart and blood vessels. Punicalagins are the major component responsible for pomegranate’s antioxidant and health benefits. They not only lower cholesterol, but also lower blood pressure and increase the speed at which heart blockages (atherosclerosis) melt away. Green tea can bring significant health benefits. It has been shown that people who drink four or more cups of green tea daily have a 205 reduced risk of cardiovascular disease and stroke compared to those who seldom drink the beverage. Green tea is also rich in catechins. Matcha Green Tea is a delicate and has a naturally sweet taste and is the highest antioxidant tea anywhere. Whole foods contain a variety of phytonutrients, vitamins, enzymes, minerals, antioxidants, anti-inflammatory properties, fiber, and healthy fats. Include more plant foods such as fruits and vegetables. Fiber rich foods lower cholesterol. Enjoy this tropical salsa, a great way to get your essential fiber, phytonutrients and healthy fats.